In this blog series we'll touch on four major components of the successful, transparent, and sustainable art market we're building through Superfine! : Galleries, Artists, Fairs, and Collectors. Each entry will run through years of tips, tricks, and philosophies that we've gleaned and provide a holding hand walking each group through how to get the most out of the ever-changing, ever-exciting art market we're building. There are challenges and solutions and as we crest over into 2018, we at Superfine! hope to provide a helpful playbook for how to navigate and prosper in a new art market that's sustainable for everyone. Since the dawn of time (OK, maybe not that long!) art galleries have provided an incredible outlet for artists who wish to expand their careers. Dealers and gallerists, passionate enough about spreading the message of contemporary art to make it their livelihood, have done wonders for artists' careers by guiding them and acting as a nearly 24/7 artist advocate. With the proliferation of art fairs and advent of online marketing, the role of the gallery has changed drastically, as has the structure of galleries and how they represent artists. For the purposes of this blog post, we'll focus on art fairs and how galleries can maximize their presentation within Superfine! and other high-quality, curated fairs around the globe. Big cities may be the epicenter of the art market, but they are no longer the sole vestige of art and artists. Inspired contemporary art is being created by artists from Duluth to Dublin, and with it comes a new wave of galleries to cheerlead those artists' success. Fairs play an increasingly important role in galleries' ability to reach diverse audiences and test new waters with their artists. At Superfine!, we strive to make our fairs affordable enough for galleries from as far flung as Japan and Mexico City to participate, yet still present a strong option for local galleries to expand their collector base. We recommend budgeting to participate in at least 3-6 fairs per year on a consistent basis - both in and out of your home market - to maximize your ability to connect with new collectors and potential collectors around the globe. With the internet and easy-to-use web templates like MailChimp and Squarespace (full disclosure: we use both! ), it's even easier to connect with global clients and make sales online after a fair. When compared to the amount of marketing it would take a single gallery to reach thousands of interested potential collectors in different markets around the globe, fairs are a comparative bargain and integral to the local gallery's success on the global front. BUT HOME FIELD IS IMPORTANT TOO. The advantages for out of town galleries exhibiting at fairs in markets new to them are clear, but what if it's a fair right in your home town? Surely you've already reached every last collector and potential collector in your area, and there's little to gain from being in a fair. WRONG! For in-town galleries, there are often even greater gains to be had from participating in an art fair on home turf than for out-of-towners. The main plus is the ability to turn fair booth discoveries into gallery visits and ultimately, long-term patronage. Whereas an out-of-town gallery has to market to new collectors online or wait until the next time they participate in the same fair, you have the distinct advantage of turning every single person who walks into your booth into someone who will visit your gallery in person and most likely bring friends, employers, clients, and others who each represent a potential collector. Consider creating a very compelling sign-up sheet or iPad sign-in that tells them a little about your programming and what they will be invited to if they sign up: wine dinners with artists, openings, or whatever else makes your gallery extra-special. When you take the right steps, exhibiting in a fair can widen your day-to-day audience - even in your own back yard. From a fair organizer's perspective, most lukewarm fair experiences can be summed up in three words: lack of preparation. Sure, there are times that the fish just aren't biting or the artists you show may just not resonate in a market, but the majority of the time lack of success is a result of winging it. At Superfine! we require artwork information and high resolution artwork images to be sent to us at least 4-6 weeks in advance of each fair, along with curatorial plans. This information allows our marketing team to do its job and place our exhibitors' artwork in front of the eyes of the public: your future collectors. The galleries who consistently succeed are prompt and thorough, and as a result are a major feature in our PR campaigns. Our team are also able to weigh in with suggestions and input on what work they feel will be most successful, and we are also able feature artwork on our E-Fair and any partner platforms (with each fair, online sales grow exponentially.) Those who don't provide this valuable information often miss out. It's quite a job gathering information from a diverse group of artists, but it makes the difference between an off-key presentation and one that sings with success. Part of our job involves attending dozens of our fellow art fairs each year, and you wouldn't believe how many fair booths we've seen staffed by a bored intern on a laptop, while the gallery owner hob-knobs elsewhere. A fair is a major expense, even a more affordable one like Superfine!, and the only way to get the most out of your investment is to be present. Interact with every interested pair of eyes, and collect email addresses. Remember, it's less about what you sell at the fair itself and more about the long term relationships you build. Someone may purchase a small piece at a fair, or not purchase anything at all, but maintain an interest in your program and your artists that spans decades and yields incalculable results over the years. Don't let a potential collector slip through the cracks - say hello and make sure you get an email address. Once you have that email address, it's up to you and your marketing team to make sure that each and every one of your shows is packaged neatly in digital form and reaches the eyes of those hard-won followers of yours. Everyone has a story of a loving patron who turned up "randomly" and became a major part of a gallery or an artist's story. Don't wait around for those moments, engineer them. Individual follow-ups with interested collectors do wonders to turn a slow fair into an unqualified success. If someone is entering the door of an art fair, they care about art enough to look at hundreds of pieces for sale. If they're in your booth looking at a piece, they're at least in some way considering it. Connect with them and follow up, before the fair is over. Don't wait around for Mr. Moneybags to come and swoop up that piece, follow up with the people that you saw admiring it. Offer payment plans if that's something you can do, or present a series of options at different price points from the same artist. Invite them back to the fair as your guest, using one of your complimentary passes (if they don't have one) and show them that despite all of the art they've seen, all of the gallerists they've talked to, you are the one who cares about what ends up on their walls. It's very tempting to judge a fair experience on in-fair sales alone, but that's a gambler's mentality. A single fair may exceed your expectations, but it will likely not make you or your artists rich on its own. Staying a true course means analyzing your artists' performance as well as your own at a fair, and understanding the long-term implications of participating. Media features strengthen your artists' value proposition to collectors, and the contacts you make last longer than the single purchase they make at the fair itself (if you manage the data correctly.) In general, fairs like Superfine! that are fair in their cost and value proposition are a highly effective marketing tool that puts your program in front of the eyes of thousands of potential collectors, while creating a highly targeted space where you and your team can both sell art hand-to-hand and also sow the seeds of long-lasting relationships whose crops will be reaped down the road. Additionally, it often takes participating in the same fair more than once to learn what works for that particular market, and that particular clientele. Don't squander an opportunity that you've already invested time and money into, learn from it and grow the next time around. PRESENT A SPREAD OF WORKS, AND PRICES. Young collectors are a real thing, and as their incomes grow so will their collecting habits. At Superfine!, we work hard to be the most transparent fair around and provide a bridge for art-curious folks to become full-fledged art collectors. That means having entry-level-priced works available. At the same time, having nothing but entry level work in a booth closes you off to other opportunities. We recommend having the following ratio for success: 25% of works between $5,000 and $15,000, 50% at $1,000 to $5,000, and 25% priced under $1,000. With emerging art, size is king, so to most clearly communicate the value of your higher-priced pieces, be sure that the size and complexity matches the price tag. Collectors newer to the art market - and seasoned ones scoping out emerging artists - tend to equate larger works with higher price tags, and smaller ones with lower pricing. Simplistic though it may be, it's a fairly easy rule to follow and generally works. That said, if you present a compelling argument for why a work is priced a certain way, you might be able to make it work. Overall, people do want to see value - even in art - and if you can follow the formula, you stand a strong chance of success. With the cost and risk of art fairs, it can be tempting to bring everything and the kitchen sink in hopes that you have something for everyone and the entire lot of it will be swooped up in short order. In reality, you're competing for the eyes of the fair-going public whose attention spans are limited and spread among not only the fair you're at, but other fairs around town during the same week. A concise, engaging, strategic presentation that takes into account the kind of short-term psychology that drives art sales is the make-or-break for a successful presentation. That's not to say that we're scared of a salon hang at Superfine! - it just needs to have strategy to it. Love an artist's work and want to show 12 of their small pieces? Try narrowing it down to 4-6 of your absolute favorites, and keep the rest handy in storage or on an iPad. Your rock star artist creates massive Michelangelo style canvases? Consider hanging just one, with smaller works from the same artist or perhaps other complementary artists. There's a huge amount of visual communication that goes into hanging a booth at a fair, and it's practically a work of art unto itself. Your goal is to catch someone's eye without over-stimulating them, and to create an illusion of scarcity while still having the tools at your disposal to entrance them with more work from the same artist. The art market is changing..don't get left in the dust! Read up on not only the hottest new artists or best collector markets, but also trends in the market and ways to adopt best business practices to increase your sales and grow your audience of collectors and future collectors. Art-centric outlets like Artnet, Artsy and others constantly cover shifts in the art market, but so do non-art publications like Forbes, so pay attention to those too. Of course, we frequently update our blog as well (here's a great supplementary reading piece you can check out!) 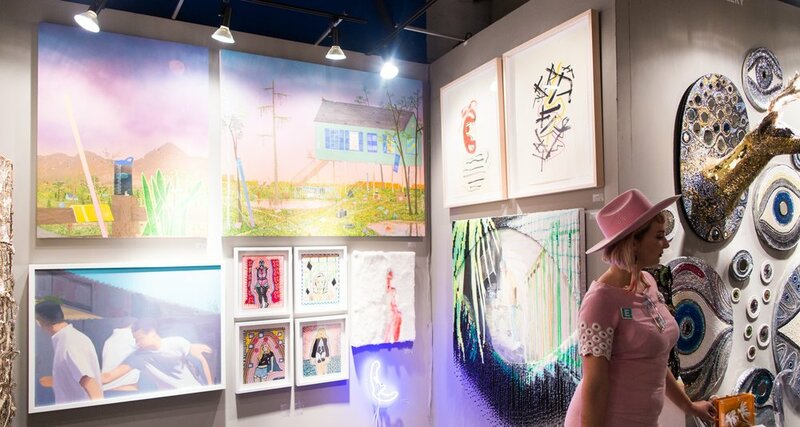 which offers our own unique perspective as the organizer of one of the U.S.' top emerging art fairs. Part 2: Artists, debuting next week. If you're interested in exhibiting with Superfine! in New York, Washington DC, Miami, or Los Angeles, click here for more information.